Happy Spring! It is really here and I almost can not believe it. The above image is the poster I am hanging all around the Hilltowns these next days promoting my show, "Roots, Sun, Flower: A Call From My Ancestors". This show is hanging again, this time in my hometown, Cummington, MA at the Cummington Community House. The show will be up the entire month of May but the opening reception is happening Sunday, May 6th, 4-6pm. All are welcome. Thank you to Cummington Cultural Council in helping fund the framing of these new paintings. A new collection of my original handmade designs will be on view at the Meekins Library starting the 1st of March through the end of the month. You are invited to the opening reception on Saturday, March 10th. Stop by any time between 12:30pm and 3pm. I'd love to see you so come on by to view the work, say hello, and enjoy some homemade goodies. This work is a continuation of my explorations of Eastern European folk art traditions. Colorful gouache paintings will give you a boost of cheer and color, making you feel ready for Spring and the bright, gorgeous flowers to come. Also I've been working on some multi-media paintings which combine my love for simple design, embroidery and watercolor. My Polish and Hungarian ancestors continue to inspire my thoughts and work which reflect my love for the natural world, the land, the cycles and beautiful mysteries. If you can not come to the opening, please feel free to stop by during Meekins Library hours during the month of March to take a look at the show. Thank you! Snow has fallen and creates a blanket over the land. It really looks and feels like deep rest is happening. In a way I feel this for myself too. Now is the time for quiet introspection, cold days and long candle lit evenings. Winter has a very special place in my heart, after long days on the move, spent outside, caring for my gardens and my clients gardens. Did I tell you that my design business, Where Earth Meets Sky, now includes my garden work and business? I've been designing and working in other people's gardens all last spring, summer and fall! What a lovely and busy time the warm months were! But now I get to return to my studio, filled with memories of bright colors and the shapes of blooming flowers, plants, vegetables and trees. Warm, sun-filled moments have seeped into my soul and feed the new work I am creating. I am happy to have some space and time to begin my sketches and drawings for the new paintings that will be made in the coming months. I have some other new developments and good news! I now have a cards rep who is out there getting me new regional accounts where I can sell my cards! She makes sure my cards are stocked in the stores where I sell and she has gotten me in to new stores that were not on my radar. For this I am so thankful! I am expanding my line of cards this winter with new folk flower paintings that will be printed onto cards and will also be available to be printed as archival prints. I have begun sketches, measured, cut and prepped paper and will begin painting once the madness of holiday scheduling has subsided. Having little kids with ever changing school and day care schedules this time of year makes finding uninterrupted studio time a challenge. I have also been making new embroideries, both sachets and little wall hangings. These will be for sale in my shop and at my gallery openings in the coming months. Yes, gallery openings! I have two scheduled in 2018. In March I will be showing my new works at the Meekins Library in Williamsburg, MA and in May I will be showing in my little town, Cummington, at the Community House Gallery on Main Street. Please stay posted for opening party dates and times. I hope some of you will come out! So as the land lay blanketed and quiet under the winter snow, I will be in my cozy studio dreaming, sketching, painting, sewing and working away bringing into reality a new garden of paintings. I have much joyful work ahead with my head bowed in concentration and my studio lights aglow while the bubble of cold air and white snow hold me in this special time. I will have a table set up in the barn at Gordon's Fold Highland Cattle at 556 Stage Road. Folk art inspired cards and a few other goodies will be on sale. Hope to see you! It seems that spring is coming early this year in New England. Although, I think I heard rumors of a snow storm this weekend! Is that true? Last week I was out raking leaves from my son's pre-school gardens and the daffodils and crocus are coming up and about to bloom and are blooming there. What a nice thing to see! Hope you all are enjoying the warmer rays and longer days. I want to say thank you to all of you who spent the time to look at my new website. I received so many kind words of encouragement and appreciation. It truly warmed my heart. Thank you! There are a couple things going on now and in the near future that I want to tell you. 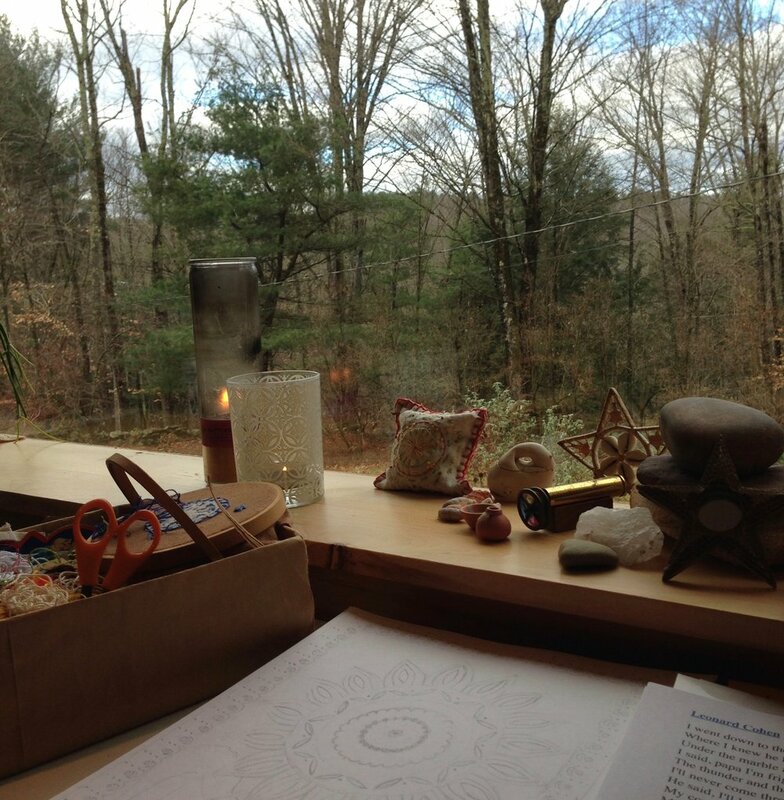 Up here in the hills of western MA, my friend, Stacey Mackowiak of Sunflower Yoga & Mindfulness, and I are offering a 4 week course exploring the intersection of mindfulness and the creative process. We will explore our inner landscapes through guided meditations and the creation of mixed portraits. For those of you who live locally, perhaps this will interest you and you would like to join us for this exploration? Starts April 26th and meets every Tues. evening, 7-8:30pm, for the next three weeks after. The course is $100 and all materials are included. Please see the attached flyer for contact info or email me if you have more questions. Finally, there are a couple more weeks left to my March, website launch promotion. Everything on my online store is 15% off so now is great time to stock up on some cards or to buy a print for you or as a gift. Everything is set up online to make shopping easy. I hope this note finds you all well and enjoying this transition to spring! I am thrilled to finally have my website and online store up and running! To celebrate its launch I am offering 15% off all items in my store. Please share Where Earth Meets Sky with friends and family who you think may be interested in my creations. After a lot of dreaming and much thought, I got to work on this grand project back in October, 2015. I called in the troops. I had a designer friend Seth Gregory, counsel me and help me choose a good, user friendly platform to use ( I chose squarespace in case you are wondering) and he helped bring the website to reality. I hired a photographer, Erin Long, whose work I saw on facebook and admired. I loved working with her and could not be happier with the photos she shot of me, my studio and gardens. I feel like the vision came together and now I have a unified space online where one can view my work, purchase my work, read my blog and artist statement and view photographs of my working studio space and places of inspiration like Raspberry Hill Community Garden. With this website project accomplished I’m happy to check it off my “to do list” and move on to other projects which have been simmering on the back burners. I will be a co-teaching an art and meditation class this April into May with Meditation and yoga instructor, Stacey Mackowiak at Sunflower Yoga. I’m honored to have been asked to co teach with her and am very much looking forward to this experience. I have six new paintings started that are sitting there begging for some attention. I have embroidery pieces to finish and others waiting to be made. Stores to contact about the possibilities of selling my things. So many things to do and such little time! Hello! Well 2015 has come and gone and I have posted ZERO blog posts during that whole time! Wow. Ok. So how are you? Hope you had a great 2015 and that 2016 is off to a good start. I have to say some happy, life altering events happened during 2015. One, the big ONE... my daughter, Mirela Jozefina, was born in February, 2015. Being pregnant, giving birth and caring for my newborn and my two/three year old son took almost all the energy I had. And two... as I came out of the new baby fog, I began to focus some of my time and attention back on my art business. Last fall I took the steps and began the process to create a website and online store that will serve as an online gallery and shopping place for all my original designs in their various manifestations as cards, archival prints, original embroideries and paintings. I am very, very excited to be coming down the home stretch of designing my website with the creative, thoughtful and artistic contributions of my talented friends: photographer, Erin Long at Erin Long Photography and designer, Seth Gregory at Seth Gregory Design. Without their help I would not have the site that is about to be launched. Thank you Erin and Seth!!! I hope you will visit me there and stay in touch via my blog through my new website. I will no longer be blogging via Blogger. Stay posted as I will let you know when WhereEarthMeetsSky.com officially launches. Thank you! Alchemy Fair is happening this weekend! along with my original designs, available as cards and archival prints. I'm really looking forward to being part of this special event. I think it is going to be a lot of fun. Craft, Food, Workshops and Entertainment. (92-114 Race Street, Holyoke, MA, 01040). $6 at the door, under 12 free. Event! Come shave your head with us and help put an end to pediatric cancer! Last Saturday I had a wonderful morning at Knack teaching paper cut techniques to ten lovely women. I had a full house show up for the workshop and we all gathered around the table and got to work. I talked a bit about Wycinanki, Polish paper cuts. I especially focused on the Kurpie style Polish paper cut which uses a single fold, symmetrical design technique. Some students used the templates I brought to class for their design and other students created their own unique designs. Every paper cut made in this workshop was created by using recycled / up-cycled materials that Knack has gathered or that have been donated to the store. All the women seemed inspired by the class and especially by the design examples I shared from books I bought while studying in Poland and Hungary. A couple Polish/American students came to the class because they wanted to learn a little about their creative, Polish heritage. It feels good to pass on the beauty and heritage of traditions I've found particularly rich and inspiring. I plan to be back to Knack sometime this spring to teach another paper cut class. This time we will create floral paper cut designs. Stay posted for the date which I will announce here and on Facebook once I book the day and time. Thank you to Macey and Amber at Knack for having me teach this class and for taking these pictures which capture the feel of a fun, creative morning at your store. Last month I created the above example and template of a hand made, paper cut, Valentine using paper remnants I found in my scrap paper folder for an upcoming work shop I'm teaching at KNACK: The Art of Clever Re-Use, in Easthampton, MA. The workshop takes place in a couple weeks, on Saturday morning, February 1st, from 10am until 12pm. Spots are still open if you want to join me! I'm really looking forward to teaching an art class again as it has been a number of years since I've been in a teaching role, encouraging other's creative energy and talents. Yes, in a past life, before I moved to western MA, I was an art teacher to middle school and high school students. I took two embroidery classes at KNACK this fall and had a ball! It was wonderful to get out of the house on a Saturday morning. I walked into KNACK with the smell of a fresh pot of coffee brewing, greeting my senses and one of the friendly owners there to welcome us. All the workshop attendees soon gathered around the table and got to work with a wonderful and talented teacher. We all learned something new that morning and it was inspiring to be in KNACK's studio space. I just got confirmation today that the workshop is a GO since I have enough people enrolled in the class to allow it to happen. And there are still some spots available if you want to join us at KNACK's fabulous creative re-use lounge. I included the following information taken from KNACK's website which shares all the info and links you need to find out more info and enroll in the workshop. Valentine’s day is just around the corner! Make unique cards to give to loved ones (or keep for yourself!). Paper Cutting is an art form that is practiced by different cultures all around the world. You will learn about the Polish form of paper cutting called “Wycinanki”; the Kurpie style of cutting from Poland is the inspiration for the projects in this workshop. This style cut out is made from one piece of paper that is folded in half, down the middle. You'll create beautiful cards to take home, and learn the skills to make many more on your own. Stop by during regular business hours to register for this class, or you may sign up online. Our cancellation policy can be found at the bottom of the Workshop listings page. Contact us! We can be reached at 413-529-0126 or info@knack.org. My little place in this world is covered in snow again. As I struggled with the flu a couple of weeks ago it became warm and all the snow melted away before Christmas. It all just didn't feel right! I began to feel better and then freezing temperatures and a few flurries came on Christmas Eve. Beginning on New Year's Day the snow officially returned. The fresh snow is one of the things I am grateful for in 2014. I have been enjoying looking at art work online that captures the beauty of winter and this snowy season. A friend recently posted art work done in the early 1900's by Wladyslaw Jarocki on facebook and I found his work beautiful. I love the contrast of the whites, greys, browns and blues of the landscape with the brightly colored scarves and embroidery accents on the traditional clothing of his Polish highlander subjects. I want to give away my black, nylon covered jacket for sheepskin, fleece lined, embroidered coats, woolen stockings, leather boots, long heavy skirts and colorful scarves and dress like these beautiful highland women. This past holiday season I was particularly inspired by eclectic paintings and other works of art posted by a blogger at A Polar Bear's Tale. The art work posted there is so special. There are illustrations, fine paintings, crafted items and photographs to be enjoyed. All the images chosen for this blog seem infused with magic, beauty and nostalgia. The posts cover themes and the art work reflects the seasons and holidays. I enjoyed looking at this blog over Christmas more than watching a holiday movie or tv program. If you enjoy looking at lovely works of art that reflect the magic of a season I suggest that you head over to A Polar Bear's Tale to scroll through the treasures there. And finally since this is the first post of the New Year I think gratitude is the word for 2014. I started a gratitude jar and before going to sleep I will write down on a piece of paper a moment of beauty from the day for which I am grateful. On New Year's Eve this upcoming year I will read about all the positive things that filled up 2014. Among other things, I am grateful for the love of my family and friends, the return of snow, celebrating Christmas again with my mom and dad who came up to visit on New Year's Day bearing beautifully wrapped gifts, birds chirping and singing outside on a walk and nearby my bird feeders and the kisses of my 18 month old, cutie-pie of a boy, Kazmir. I've been busy getting my things ready for this fun event that I am helping put on and organize with my neighbors. I feel so lucky to live in such a beautiful area with many talented artists and farmers. Our Walkabout has become a tradition I look forward to which encourages the support of local arts and farms and the local economy. I hope some of you can make it out here to take a stroll and visit our neighborhood. Mark your calendars! Leni Fried Printmaking at 494 Stage Rd. (www.lenifriedprintmaking.com) and One-Off Handcycles (oneoffhandcycle.com) have a shop and studio in their 150 year old barn. Leni Fried, an artist of over 30 years debuts her latest tree monoprints, cards and affordable art inspired by our landscape. Mike Augspurger from One-Off handcycle builds and sells a three wheeled handcycle for off road use for people in wheelchairs. Rosemary Wessel (www.rosemarywessel.com) will have cards and original oil paintings of trees and more other-worldly subjects. She will also be showing in their barn. Next on the tour at 509 Stage Rd. is Kimberly Wachtel: Where Earth Meets Sky Designs. You can't miss Kim's brightly colored house which reminds one of her whimsical, original handmade designs inspired by traditional Polish, Hungarian and Eastern European art. paintings and cards. Her hand made paper cuts, paintings, prints, cards and embroidered items will be for sale. At the top of the hill at 523 Stage Rd. is the old Colonial, site of the former Stage Road Tavern where one was served grog! You can ask for grog, but you may receive a pottery tour in its stead! Steven Jones, potter, will be showing his work in this classic colonial and barn. The last stop for the Walkabout at 556 Stage Rd is Gordon's Fold Highland cattle. Look for their long horns and shaggy manes. Eric Driver has continued his grandfather Gordon's tradition of grazing these animals on this land. We encourage you to feel the crunch of fallen leaves, the brisk air and warm up with cider, art and refreshments at each location. Shop local, walk local this holiday season. Leni, Mike, Rose, Kim, Jim, Steven, Eric and Monica..."
These new Christmas Tree and Snowflake paper cut images are at the printers this week to be made into holiday cards for the upcoming season. I thought I'd give you a little preview of what I'll have available at the Walkabout, craft fairs and at the stores where I sell my things and here on my blog starting in the beginning of November. It is good to have some new items made to sell at the various sales opportunities coming up in the next few months. I liked making these Christmas "Tree of Life" designs and Snowflake designs. Working with colorful paper, coming up with original, folk-style inspired images and symmetrical design is satisfying for me. I like the moment I unfold a new piece after cutting it for an hour or so to see if it works. A sunflower grew to be twelve feet tall in my garden this year. She was a volunteer. I did not plant her. She is the daughter and granddaughter of the sunflowers that grew in the same spot over the past few years. I've come to think that her presence is the guardian of the house and the land. Everyone who comes to my house comments on her. I like her strong, quiet companionship. Sometimes I go out to the garden and just stand next to her. All alone. I look at her beauty and think about how she teaches me. In return I admire her and give her a little of my company. Her flower head is over a foot in diameter. The seeds are riping and later this fall they will feed the birds, squirrels and chipmunks who will come. Her head is heavy, bent down in a pose of humility and surrender. The dazzling yellow petals have whithered away. The nights have turned chilly. Her heart shaped leaves draw inward towards her strong and straight stalk holding her upright even in the rain and in the wind. She surrenders to the season. Fall is here and the trees, birds and flowers are letting us know. It has been a truly beautiful two weeks. I can't remember a more beautiful turning of the leaves to their golds, reds and coppers. Rain came today and everything is beautiful in a different kind of way. In light of listening to a weekly poetry program on the radio, I feel like sharing another Mary Oliver poem. I just love her work. This excerpt from the following poem The Sunflowers resonates with me. Oliver just squeezes out the truth, the essence of a thing, the essence of spirit the truth about what it means to be alive. My friend Bi-sek has been interested in homegrown, healthy food for longer than I've known her. She's a talented organic gardener, cook, community organizer, nutritionist, health enthusiast, environmentalist and mother. I admire her and her work as she pushes herself as a woman and a professional. She is also the founder of the community garden that I am involved with called Raspberry Hill Community Garden. Last year she commissioned me to design the above logo for a business she is developing. She wanted something hand drawn and painted in my colorful folk style. Since her business is about transforming oneself through nutrition, my inspiration for the drawing started with a seed blooming into a vibrant flower. I choose the sunflower because not only is the plant beautiful, the seeds are nourishing. We decided to put some images of healthy vegetables and fruit in the corners of the composition. Bi-sek and her daughter shared a gift this past winter with me and Kaz. They would come over to my house to play with Kaz and give me a little break from taking care of the baby so I could head over to my studio for an hour, two or three to work on this project. At this time it was important for me to start reclaiming my artistic self. This project helped me do that. Thank you, Bi-sek! You can find out more about Bi-sek's work with nutrition at Wholesome Transformations. All photos were taken today, a glorious September day, at the Raspberry Hill Community garden. While on a drive this week I came across a radio show where poetry is read. The host read a Mary Oliver poem that took my breath away. I think her work is deeply beautiful and true. In the winter and spring of 2012 I worked on a wedding invitation commission for my cousin, Bridget. She and her (now) husband, Matt, wanted a clean, organic design with fresh, spring green being the only color amid simple neutral tones. She wanted an image that was inspired by nature. Her desire to have a clean simple design made me think that a paper cut would be the perfect medium for her invitation. After a couple experiments and attempts I was hit with an inspiration for the design after looking through a few books from the library of botanical drawings. I simplified the idea of a curving organic branch in a neutral dove gray and added birch like spring, green leaves which attached at the ends of the branches. I cut the paper using scissors and an Exacto knife. Using this branching leaf design I created a frame for the text in her invitation. We went through a bunch of different fonts on dafont.com and found a nice font with a handwritten, organic feel. Bridget really wanted a tri-fold card. This design incorporated a "cut-out" postcard for attendance replies. She did not want a lot of disconnected pieces of card paper and envelopes to be a part of her invite. The cover of the card was simply the image of the branch with leaves and the names of the couple. When you opened the card, all the information regarding the wedding was there...the announcement, the location and a RSVP card to fill in, cut out and send back. On the back of the card was some more logistical information, the address the return post-card and a place giving credit to the the designer...Where Earth Meets Sky Designs. This project was a huge learning curve for me. I learned more about using the design programs on my computer, Photoshop and Illustrator. Thank you, Josh for all of your help with the computer programs! A local co-op called Collective Copies did the printing for us. Despite some hiccups with the printing machine used for the addresses on the envelopes, it all worked out in the end. I delivered the completed project to a very happy bride to be. Thank you Bridget and Matt for hiring me to be a part of your wedding in this very special way! In 2011, upon return from my trip to Poland and Hungary, a woman who donated some money to my quest got in touch with me. She liked the images I was making inspired by eastern European designs. She also admired my quest to travel, learn and meet family. She wanted me to design a tattoo for her based on my eastern European Folk Flowers. A big birthday was coming up for her and she wanted a special tattoo to mark this passage in her life. She is a talented flower arranger, has a flair for creative color palettes and creates unique, locally grown flower combinations that are used in her arrangements. We got together to talk about what she wanted. Then I got to the drawing board. A tattoo! A bit daunting, isn't it? Tattoos are a creative expression that are pretty permanent for a lifetime. I wanted to make sure that the design I came up with would be something she'd want to live with for the rest of her life. I created two design options and she liked them. She took elements from them both and used them in her final design. This was an interesting process for me because I never had to design an image with the dimensionality of the human body in mind. Bone, skin, muscle...it was a cool challenge. Especially for the location of her tattoo as she wanted it to come from her foot, around her ankle (where that ankle bone protrudes) and up her calf. Ultimately I had to hand the design over to the final artist, the tattoo artist. She would bring the image to the skin and to life. We met with her and she thought she had something good to work with. She and my client tweaked some of my color choices and varied the drawing just a bit, combining elements from both drawings, so that my work would translate to the tattoo medium, needle and ink, skin, muscle and bone. When I got to see the pictures of the final result I was happy with how the image found a home on my client's skin. Graphic folk art patterns and design lend themselves well to tattoo art. The colors are so vibrant and beautiful. I know that my client really wanted colors that were vibrating with life as part of her tattoo. This commission was a fun project and good challenge. I really enjoyed working with my client. I'm happy she has a piece on her skin that means so much to her. It reflects her life and her work with flowers.